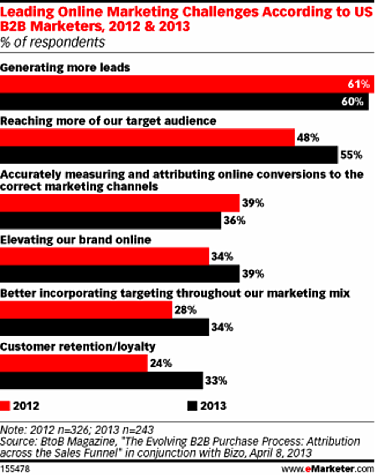 When growth executives of B2B organizations are quizzed on the challenges and barriers they face to achieving their goals, generating more leads is always at or very near the top of the list. It makes sense (and our research backs this up). You simply cannot have predictable, scalable growth without predictable, scalable lead generation. An important component of lead generation is prospecting. I’ve written a lot (some would say too much) about how the customer and successful sellers have changed the way they engage and work together. Despite these changes, I still see a number of businesses relying on their salespeople to prospect. The root assumption that gets Sales VPs fired (although the Board and CEO are equally responsible) is the false assumption that salespeople will find new business on their own from past Rolodexes or lots of cold calls, with a minimum of help or investment from the company. Experienced salespeople are terrible at prospecting. Even if a salesperson does do some prospecting successfully, as soon as they generate some pipeline, they become too busy to prospect. It's not sustainable. As the title to this post indicates, successful B2B lead generation is simply too important to leave in the hands of your salespeople (and please note, this is not a slight against salespeople). I don’t mean to sound all “lecture-y,” but if you’re serious about accelerating or even sustaining your growth rate, you simply must build a dedicated lead generation and management team. Building such a team does not necessarily require that you increase headcount, break the bank on technology or build complex processes within your organization. We work with a number of companies that get started with this approach and don’t even have a full-time equivalent employee dedicated to building it. There are four cornerstones to successfully building a dedicated lead generation/prospecting focus. Data is crucial to successful execution of any lead generation or B2B prospecting effort. There are two ingredients to prospecting success: volume and velocity. Because of that, very small differences can lead to a huge difference in results. If you’re not tracking and monitoring your progress with the right data, you won’t be able to make the adjustments that lead to success. Response rate – how well do people respond to your emails and phone calls. 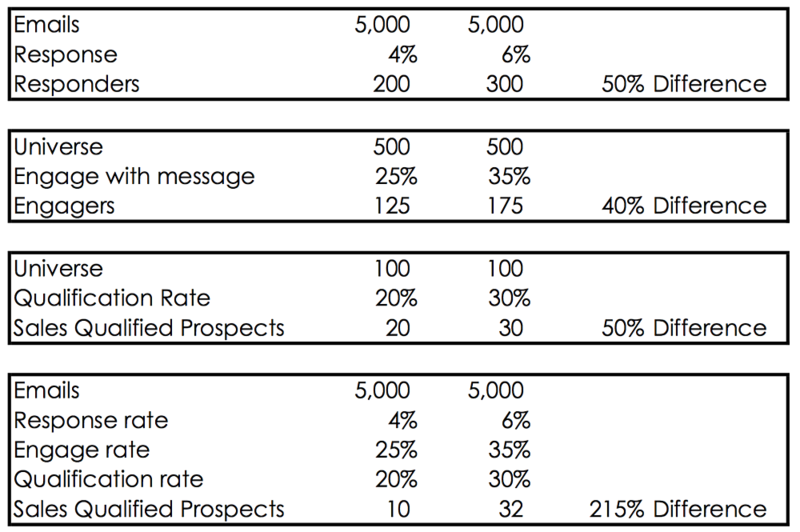 Qualification rate – how well your prospecting team does with their conversations will impact how many qualified prospects are passed on to your sales team. The last scenario illustrates just how big of an impact these components have on your results overall. Successful prospecting does not happen in a vacuum. If you’re asking anyone – even a dedicated prospecting team – to merely “smile and dial” you will not be successful (and you’ll anger a lot of your market as well). There are three prospecting strategies that you can choose from. You must determine which strategies you’re going to implement and support the strategy fully. I’ve got bad news for all of the old schoolers out there. Content is here to stay. Earning and keeping your prospect’s attention is a ticket to the opportunity to get their business. Additionally, you must be able to consistently deliver a unique teaching point-of-view that resonates with your prospects. Nurturing your leads is necessary if you want to build any level of consistency in your efforts, and that means you must be developing content. The mindset of a prospector is simply different than the mindset of someone who manages the core sales process. I’m not saying everybody is incapable of doing both functions (I know many who have done each of these with a great deal of success), I’m merely saying you can’t do both well at the same time. Successful prospecting is a high-velocity function. It requires consistent effort, and if you’re looking to scale growth it must be done all of the time; not just when a salesperson has downtime. It also requires a different approach. In prospecting, you’re making the “why should you talk to me” sale. Salespeople are trained to make the “why should you buy from me” sale. What this means is that when salespeople prospect they often try to take the prospect too far, too fast and actually lose what would have been a viable opportunity. Plus, think about it this way. If you’ve got a salesperson who’s doing even an above average job of closing business, but they’re not prospecting adequately; what are you going to do? Would you fire them because they’re not prospecting? Probably not. What if they were prospecting well but not closing business, would you fire them then? If you agree with me that lead generation and prospecting results are important, then you need to have specific people that are accountable to the specific result want. So, no matter how you look at the issue, building a dedicated effort focused solely on creating sales qualified leads is both the most efficient and the most effective way to succeed (and by the way, if you look at the numbers, you’ll also find it’s the lowest cost).